26.01.1917 - 24.03.2019 Passed away peacefully aged 102 at Kalamunda Hospital. Loving and devoted Husband to Leokadia. May he rest peacefully in God's care. A Requiem Mass to Honour the Life of the late Mr Jan Chalubinski of Maylands will be conducted in Our Lady Queen of Poland Catholic Church 35 Eighth Avenue Maylands commencing at 10.30am THURSDAY (04.04.2019). At the conclusion of Mass the Funeral Cortege will proceed to KARRAKATTA Cemetery Railway Road Karrakatta for interment commencing from the main entrance at 12.45pm. Vigil Prayers and Rosary will be recited in Our Lady Queen of Poland Church commencing at 7.00pm Wednesday Evening (03.04.2019). 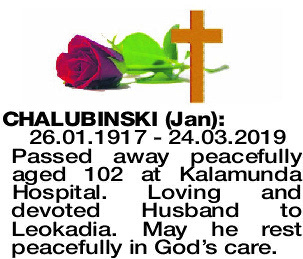 CHALUBINSKI JAN Farewell to our much loved uncle; may you rest in peace. Deepest sympathy to ciocia Lodzia.